''My friend and I organized a bake sale during Diwali to raise money for non paying surgeries at LVPEI. Neha was the baking expert and I was the manager. 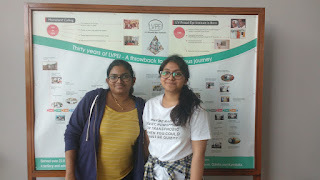 It was a lot of hard work but when we came to the hospital and met the people in the Institute's rehabilitation centre, we realized everything was worth the time and effort. We are planning on doing some more bake sales in future. We experienced happiness in giving, and hope others can too." 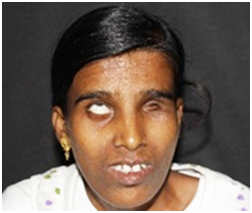 Before the surgery Gouri Behera, 32, from Dhenkana District, Odisha, was born with limited vision in only one eye. Even that deteriorated over time, and her eye ball gradually shrunk. When she came to LVPEI Bhubaneswar, she had no vision at all. Dr Vivek Warkad and Dr Suryasnata Rath performed a series of surgeries comprising 'hangback extraocular muscle recession' and 'fixation of the globe to the bony wall'. The team successfully managed to restore not only her vision, but also the shape of her eyeball, thus improving the overall cosmic appeal of her face. 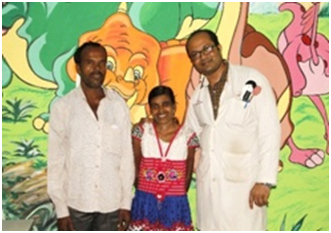 It is indeed a life changing experience for Gouri who is now able to see the world, and live a life of dignity and hope for a better future. Ravula Munaiah, 52, used to earn his living by repairing recorders and radios, until his vision began dwindling. 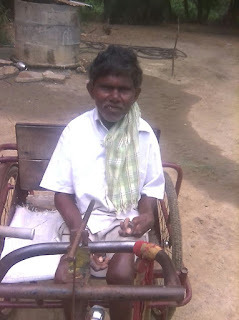 Being single and handicapped by polio, he became completely dependent on his relatives. An LVPEI Vision Guardian referred him to Secondary care Swarna Bharat Eye Centre in Nellore where he was subsequently operated for cataract in both his eyes. Extremely happy with the vision outcome, he actively participated in the community screening program organized by the LVPEI team in his village, and personally counseled those who were advised surgeries. Encouraged by his advocacy, many from his village visited the centre for follow-up treatment. “I can once again see everything and that is a very big thing for me,” says Munaiah.